When you hire us for a tree removal, we’ll take your tree down with the right equipment, carefully and safely. Making sure your home, patio and outdoor living areas remain unscathed. Tree removal work is very dangerous and highly technical. Our teams are lead by I.S.A. 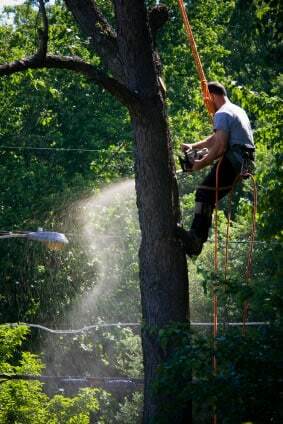 Certified Arborists, with decades of experience to draw from. Having the right equipment is key. That’s just one reason we’re able to do the highly technical removals some tree companies shy away from. 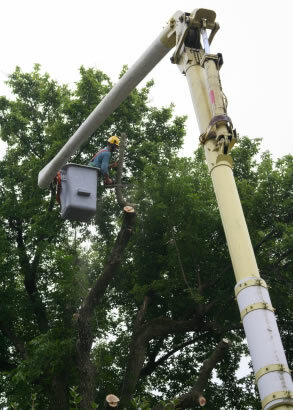 For residential or commercial tree removal, we’re well equipped with bucket trucks, excavation equipment, wood chippers, you name it… we’re ready. There’s nothing we’re not equipped to handle and there’s little that we haven’t seen before. Tree removals are done in an organized, controlled, professional manner. Depending on the situation, sometimes trees can be easily hauled off with our loader. Tighter situations close to homes and landscaping areas call for a little more finesse and attention to detail. Under those circumstances a tree may need to be cut up into small pieces and carried out by hand. We do that all the time. Whatever the situation calls for, we know the right way to go about it so you’re property is protected and everyone is safe. We don’t do large scale tree clearing. But we will clear smaller subdivisions and do some lot clearing. But that’s not really where we shine. Because Arboscape is also a landscaping company we’re sensitive to how trees can impact the way you experience your property. A typical tree clearing company isn’t going to advise you on how a particular tree will shade you in the summer and give you added winter light for your kitchen.